In Android Java Applications we use a logging system to record log events including errors, debugging, etc. at runtime and obvoously you do not want Verbose triggered in your producition application. everything above that log level shows in logcat. Thus if you want everything to show you set Verbose log level. Logs of levels Verbose through Assert are sent to the Main Log stream, in other words all application logging. triggered in the application we are debugging without changing any code? as the isLoggable if statements ensure its not executed if not set to Loggable. first steps in best coding practices. If you are on Linux, when Google updated the SDK in May they did a soft update that did not change the revision version to correct an aapt on Linux. To get rid of the error go into the avd manager and delete 1.5 and 1.6 and instruct the avd manager to download and install them again. 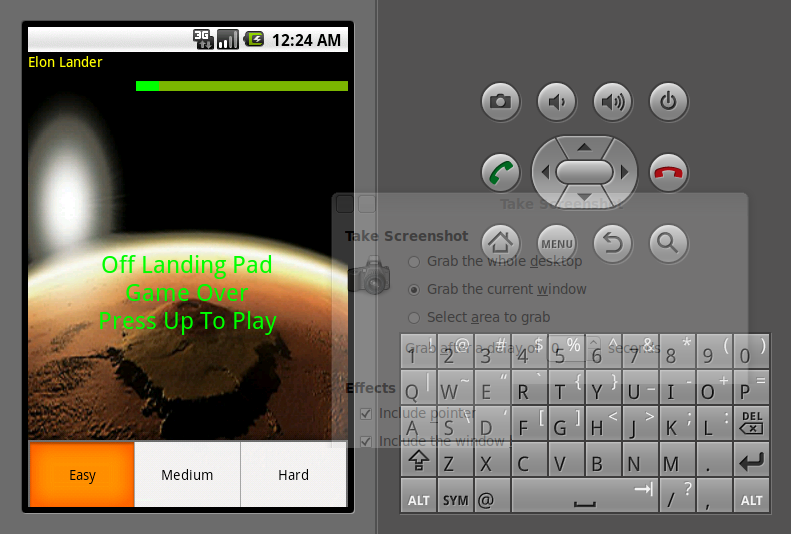 Its a visual programming tool to develop android applications. Game name is changed to TranquilityBase, I still have to add the input pipe-line features. And what do we do about sound? Yes, its true that the moon had no atmosphere to give sound to the engine thrust shock waves. Mars has an atmosphere, not dense as ours but there is one. Thus, the sound should be louder than the popping sounds you have heard form the lunar lander on moon audio tracks when the lander took off back to the command module. And I did some code cleanup. 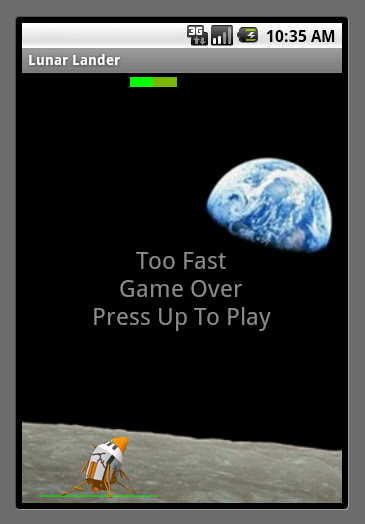 This is what the Lunar Lander sample looks like with some code and UI cleanedup. 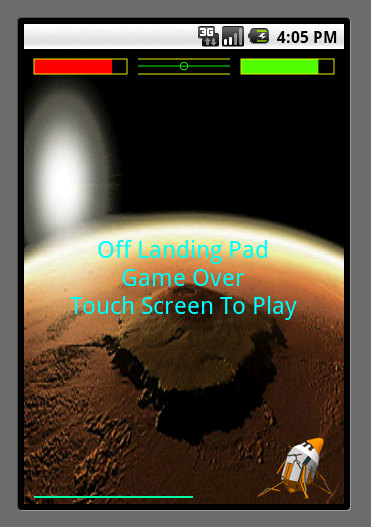 Notice that I took off the game start, stop, pause, resume functions from the options menu. But it could be better as there s no input pipeline example and touch events are not even integrated within the game. I will probably end up coding a input pipeline and touch integration and contributing that back to the Android Project. Than re-do the code as Rokon2d game engine 2.0 game as Rokon2d Game engine version has a physics engine as native code and some other new features. With all this talk about a probable FB competitor named GoogleMe the proof would be a GoogleMe connector in Android 3.0. I have yet to see anything, of course it still may hidden at the moment.